Description: Print Version of the same detail page. Print-Friendly template. Role: Designed and programmed the page, including all code and graphics. Also designed the animated logo and the website design + navigation. 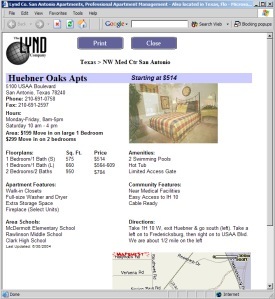 Also collected property detail information, connected to Mapquest and optional 3D QuickTime Tours.